Sticking with our summer theme, we finish up with my last find from Hand-Shaped Art. Again, this project is pretty basic, and may already be out there, but we put it together, so we thought we would share. 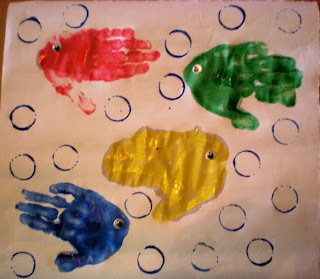 I had two little ones help me with this project so we created four fish. Let me begin, by saying that if I was doing this at school, I would need a bit of parental help. 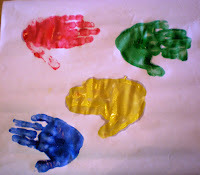 I always find when doing hand or foot painting projects with lots of children can get tricky. Sometimes I modify the project to a tracing and cutting project. But, I will say that a handprint of paint has lots more character. The first thing to do is get your large piece of paper. Let the children decide what color fish they would like. Now, paint the hand, either they can do it, or you. After there hand is painted it gets pressed on the paper with the thumb out like a fin. I must say I thought our little green fish had a bit of "attitude." He resembled an angel fish--at least to me. 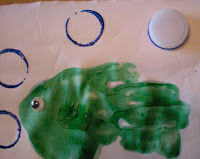 To make the bubbly water, I used a bottle cap dipped in blue paint and just pressed circles all around. To finish the project of I gave each fish a google eye for some added fun! Swim fish, swim! I really like these. I feel like I could go on and on with ocean and beach crafts! I love hand crafts-and it's always fun to find another beach project. So creative! Is there anything you CAN'T make from handprints?? I just found your site......I will visit often. Great ideals for my 2 & 4 year old!! Where did you get the google eyes?